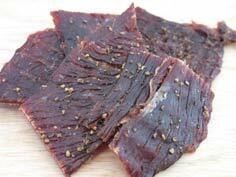 Slice meat into strips of about 1/4″ thick. Mix ingredients and coat meat. Let meat marinate in bowl, cover and refrigerate as long as you’d like. Take out, rinse off thoroughly and pat dry with a couple of paper towels. Lay out onto trays of dehydrator and dehydrate according to your dehydrator’s manual. Enjoy!